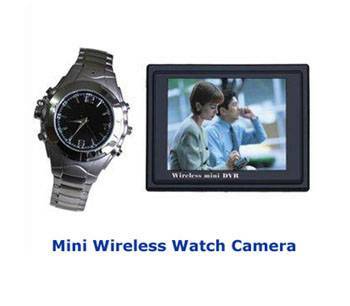 A normal but luxury sport wristwatch has one smallest camera inside.Just press the power switch; it begins transmitting high quality color video with sound to our supplied 2.4GHz wireless MPEG-4 Daytime stamp DVR up to 300 feet away. Needless to use any cable to connect with them. Put the DVR in a Bag or on a Belt,ThenJust press one button , It will start to transmitter video and audio simultaneously . It also works as a normal watch. 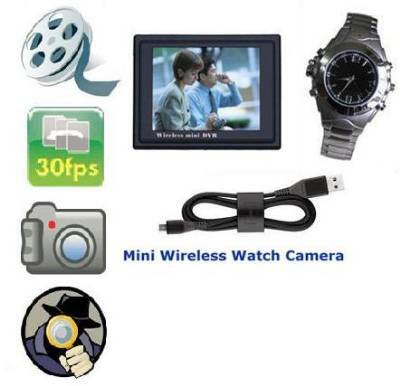 Moreover, It's ideal for the security personnel, law enforcement agencies, journalists to fulfill the undercover assignments, like evidence collection, hidden investigation and surveillance, etc. It is also great as a toy for hobby enthusiasts, as body worn solutions. 2)Tiny pinhole camera lens is safely hidden inside a working watch with a standard MP3 watch looking, making it ultra-discreet. 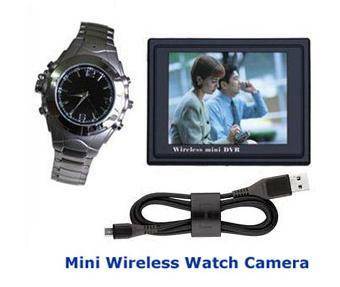 3)Long continuous operating time for camera wristwatch up to 1 hour. 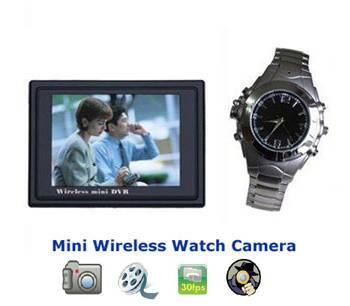 5)2.4G wireless 4 channel 2.5 LCD color monitor recorder DVR provides high quality AV for view and record, no need to connect with any cable or any other equipment. 6)Rechargeable Li-battery for wireless receiver enables at least 6 hours continuous working. 7)No need installation, just plug and play. Video Format Mpeg-4, AVI (640 or 320 @ 30fps) MP3, Wav.